though great and noble, met ungratefulness. poor and a stranger, Romeo accomplished. who, given ten, gave Raymond five and seven. it though it praise him now would praise him more. This is one of my favorite stories in Dante's Commedia as it speaks volumes about the true nature of romance. That's why I've placed it as the first story in this section on romance stories. Romeo of Villeneuve (1170-1250) was a minister and chamberlain to Count Raymond Berenger IV of Provence (reigned 1209-1245). The name Romeo denotes one who has made a pilgrimage to Rome, or a pilgrim generally (see Vita NuovaXL.6-7). 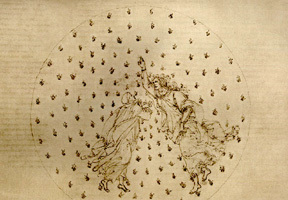 Hence arose the romantic legend recorded by Villani (VI.91), and followed by Dante. Romeo had been a poor and humble pilgrim and stopped at Raymond Berenger's court after his pilgrimage to Rome. The Count appreciated Romeo's virtue and wisdom, and before long appointed him minister. The Count had four daughters and no son. With prudence and sagacity, Romeo succeeded in making each of Raymond Berenger's four daughters a queen, arranging the first daughter Margaret's marriage to King Louis IX (St. Louis). Soon King Henry III of England, in order to be brother-in-law of the King of France, took the second daughter Eleanor as his wife. Then Henry's brother Richard of Cornwall, King of the Romans took the third daughter Sancha as his wife. For the fourth daughter Beatrice, Romeo found a brave man who could be a heir to Count Raymond's estate Charles of Anjou, brother of King Louis IX, and founder of the French Kingdom of Naples. In this manner, Romeo increased the income of Count Raymond threefold, maintaining always a grand and honorable court. Certain barons of Provence, jealous of Romeo's influence with the Count, accused the good pilgrim of having badly managed the Count's treasury, and incited Count Raymond to ask Raymond for an accounting. The noble pilgrim said: Count, I have served you a long time, and brought you from low to high estate, and for this, through false counsel of these barons, you are ungrateful. I came to your court a poor pilgrim, and have lived modestly on your bounty. I renounce my service, and return to you all I've earned here. Just give back my mule, my staff and knapsack as when I came. The Count would not have him go, but Romeo would not stay, and he departed as he came, and no one knew whence he came or whither he went. But many held that Romeo was a sainted soul. And now I too honor this noble spirit as Dante did some 700 years ago Romeo, the pure soul, who brought romance to Count Raymond's court, marrying off all of his four daughters well, making each of them a queen.